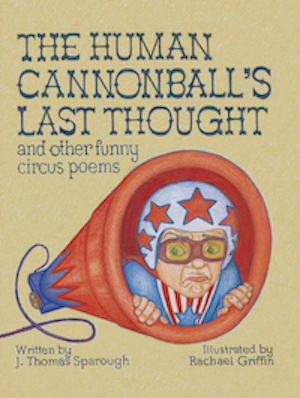 The Human Cannonball's Last Thought is a collection of more than two dozen, funny, circus poems is hilariously illustrated. There is a laugh on these pages for everyone, from toddler to grandparent and everyone in between. And yet, the collection is more than funny. It is easy to fall in love with the characters and animals on these pages. Sparough's clever, and often surprising, poems are matched beautifully with Griffin's intricate, tender and sometimes outrageous images. This writer-illustrator pair has created a circus world, which crowds of people will go back to time and time again!